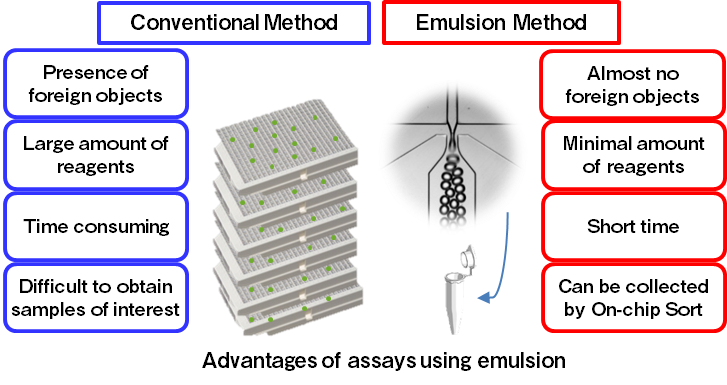 Assays using microtiter plate is commonly used for life science and drug discovery research. However, the presence of foreign substances such as non-target cells, cell fragments, nucleotides and protein in the wells of microtiter plate has immense impact on the assay, causing, for instance, increase in background noise, decrease in sensitivity, and occurrence of false positives. The volume of each microtiter plate well is about 100µL.. On the other hand, the volume of an emulsion droplet of 50µm in diameter is about 100pL, and thus it is almost 1 millionth of the volume of the well. Formation of small compartments significantly reduces the likelihood of foreign object containment, and thus increases the analysis accuracy. Furthermore, the small volume reduces the time, cost and the amount of reagent required for reactions while increasing the throughput. For example, one million reactions would require about 2600 of 384-well plates, whereas one million emulsion droplets would fit inside a conical tube. However, there are no droplet generation instruments currently on the market that allow for production of monodisperse emulsion droplets with size adjustment function. For this reason, we have developed On-chip Droplet Generator that produces emulsion droplets within the microfluidic chip used for On-chip Sort. Microfluidic chip is used to produce stable and uniformly sized droplets using our disposable microfluidic chip. Droplets containing objects such as cells and DNA can be generated by using cell or DNA suspended sample. Other reagents can also be introduced together. 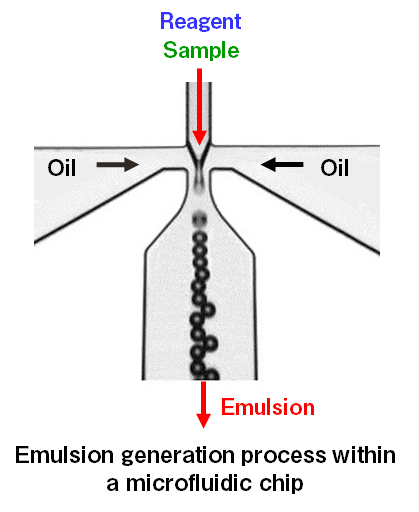 Enables droplet size adjustment by controlling the pressure applied to sample and oil.